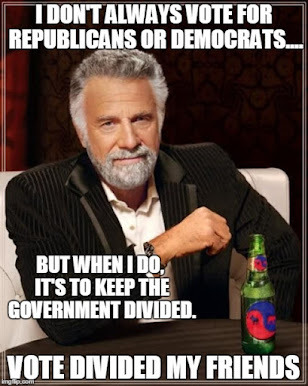 The Dividist Papers: Hypothetically speaking - "Americans Elect" could disenfranchise New York State (or any other state) in the 2012 presidential election. 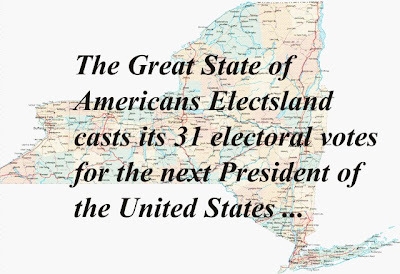 Hypothetically speaking - "Americans Elect" could disenfranchise New York State (or any other state) in the 2012 presidential election. Americans Elect (AE) is an organization that intends to qualify for the 2012 presidential ballot in all 50 states, then field a presidential slate through an open nomination process on the internet. The Dividist took note of the organization when they received favorable coverage after "de-cloaking" a few weeks ago. Realistically, we can expect "Americans Elect" to have as much impact on the 2012 election as their predecessor organization "Unity08" had on the 2008 election. Which is to say - none. They can probably be safely ignored until such time as they show some real traction. Still, this is an organization that proposes to dramatically change the way we select our President and they appear to have the financial support and the legal wherewithal to succeed with their ballot initiative. As such, it is prudent to take a deep dive into Americans Elect representations and bylaws, ask questions, and look for unintended consequences. Some are already working this beat. Jim Cook of Irregular Times is skeptical and has been frustrated getting his questions answered. Sol Kleinsmith of Rise of The Center is more favorably inclined, has been promised an interview, and is soliciting his readers for questions to ask the organization. It should be an interesting interview. Out of the subsequent discussion at RoTC an interesting artifact of the America's Elect proposed process for nominating and electing our president emerged. 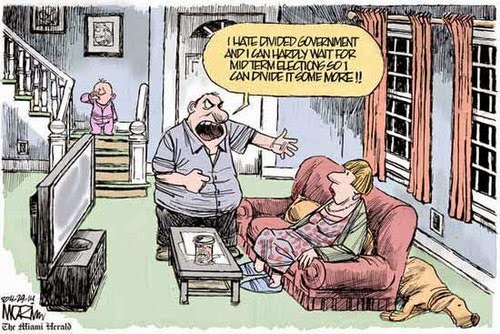 The Dividist considers the scenario intriguing enough that it deserves a post of it's own. Here is the scenario. Let's say American's Elect has successfully obtained ballot status and fielded a credible presidential candidate in 2012. They lose the election but win a plurality in one or more states and consequently neither the Republican or Democratic candidate have a majority of electoral votes. This is a plausible scenario (unlike actually winning the presidency for an AE candidate – which has a zero possibility). While there is no history of third party candidates winning the presidency, they have on occasion won the electoral votes for one or more states. One could easily envision an AE candidate with a strong geographic appeal winning a plurality in a state and secure their electoral votes as a favorite son. In those circumstances AE would broker the decision between the Republican and Democratic presidential candidates for the entire country. The Americans Elect ticket receives fewer popular votes nationally than the ticket of at least one of the major political parties and the Americans Elect Delegates have convened in convention after the popular vote but before the Electoral College vote and endorsed a candidate of either major political party on such terms and conditions as may be reflected in the vote of endorsement, in which case the person serving as Elector shall vote solely in the affirmative for the endorsed candidate and for no other candidate. It is November 7, 2012. A plurality of the people of New York state have voted to put their confidence in AE candidate Michael Bloomberg. In a close election, neither Democratic candidate Barack Obama or Republican candidate Mitt Romney have secured a majority of electoral votes. New York's 31 electoral votes will now determine who will be president. All of the registered voters of New York are not AE delegates. They voted in a general election for a candidate – Michael Bloomberg. Yet by AE bylaws, Michael Bloomberg is now sidelined and will not decide how to cast the New York electoral votes on behalf of the people of New York. Instead, Americans Elect delegates will decide whether Obama or Romney receive New York's 31 electoral votes and the presidency. 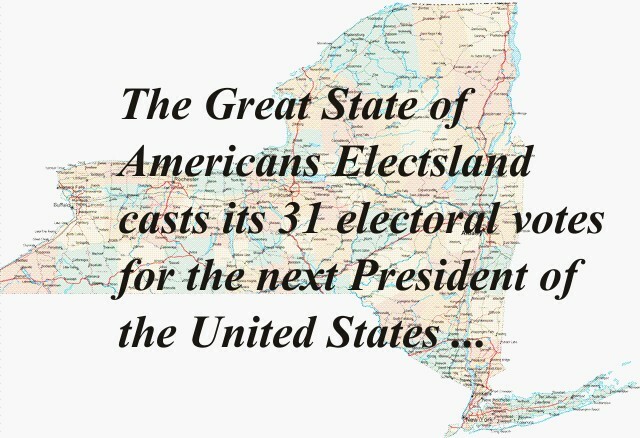 As a practical matter, the people of the state of New York will be completely disenfranchised in the 2012 electoral college vote. How do you think they will feel about Texans, Floridians and Californians deciding whether their 31 electoral votes will be cast to make either Obama or Romney president? If clearly understood, would any New York voter to take that risk? These are rhetorical questions. The answer is obvious. The Dividist thinks that in their haste to put together bylaws for their ballot initiative, AE did not think through the political ramifications of this provision. Assuming they get on all 50 state ballots and come up with a credible candidate, they can easily be undone by this provision alone. It is just too easy to run against. If an AE candidate shows any strength in any state, the consequences of an AE win in that state will be shouted from the rooftops by competing campaigns, bloggers, pundits, partisan of both parties, and the mainstream media. The message is simple and easy to communicate: The state will be disenfranchised in the Electoral College if the AE candidate wins that state. From a tactical political campaign perspective, this is the equivalent of leading with your chin in a boxing match. The Dividist suspects that AE has a glass jaw and it would not take much of an uppercut to put them on the canvas. One has to believe that once Americans Elect realizes this problem, they will change these bylaws if they can. If nothing else, this is a cautionary tale on the importance of transparency and the need for a deep dive when vetting those advocating new ways to elect our president. If the top gun political public relations professionals that run AE missed something like this, you've got to wonder what else they missed. The Devil is in details. The details need to be out in the open where we can look for the bugger. I don't see how this works. Most states (I presume NY is one of them, but haven't checked) require that their electors give their vote to whoever won the plurality of votes in the state's election. And when this means that no candidate gets the magic 270, then--to the Constitution!--the House votes to decide the presidency. Section 9.3. Unpledged Electors. Except as provided by Section 9.4 below, or otherwise required by state law absent judicial order to the contrary by a court of competent jurisdiction, all persons serving as Electors on behalf of Americans Elect shall be unpledged to vote in the Electoral College for any particular candidate for President and Vice President of the United States. So while they acknowledge the preeminence of state law, they also carve out an exception for a judicial intervention to allow their electors to go to the Electoral College unpledged. It is almost as if they intend to challenge the state law and allow the electors to be unpledged and contractually obligated to AE. In 2012, The National Popular Vote bill could guarantee the Presidency to the candidate who receives the most popular votes in all 50 states (and DC). Every vote, everywhere, would be politically relevant and equal in presidential elections. There would no longer be 'battleground' states where voters and policies are more important than those of other states. When the bill is enacted by states possessing a majority of the electoral votes-- enough electoral votes to elect a President (270 of 538), all the electoral votes from the enacting states would be awarded to the presidential candidate who receives the most popular votes in all 50 states and DC. The bill has passed 31 state legislative chambers in 21 small, medium-small, medium, and large states, including one house in AR, CT, DE, DC, ME, MI, NV, NM, NY, NC, and OR, and both houses in CA, CO, HI, IL, NJ, MD, MA ,RI, VT, and WA . The bill has been enacted by DC, HI, IL, NJ, MD, MA, VT, and WA. These 8 jurisdictions possess 77 electoral votes-- 29% of the 270 necessary to bring the law into effect. I am not a fan of this measure. In fact, I actively oppose it. However, unlike some, I do acknowledge the legitimacy of this approach - to whit, do an around a constitutional amendment via creative state legislation. I think it is foolish for any states other than NY,CA,IL,FL,PA and Ohio to support this bill. It disenfranchises most states and makes them virtually irrelevant in a presidential election. Even if this bill is passed in the 11 most populous states (which are all that is needed for the 270 majority), it will never be embraced my most of the states. And the first time one of these large states is forced to cast electoral vote according to this law that elects a president counter to the wishes of majority of citizens in that state, it will be rolled back and the whole thing will fall apart. We are after all the United States of America, not the United Peoples of America. "In 2012, The National Popular Vote bill could guarantee the Presidency to the candidate who receives the most popular votes in all 50 states"
The legality of which is highly questionable, and since it would by definition involve state's electors casting electoral votes for candidates that failed to win that state, the local political fallout alone would be immense. Similarly, "Americans Elect" are openly promising to run a candidate that they openly acknowledge they WOULD NOT CAST THEIR PLEDGED ELECTORAL VOTES FOR IF THEIR CANIDATE WON ANY STATE(S). That's illegal in 24 states, and those laws have been upheld by SCOTUS. Similar local fallout would be expected. Dividist's title is 100% accurate: The Americans Elect plan is one that openly avows to DISENFRANCHISE the actual voters of any state their candidate takes. Like the National Popular Vote Act proposal, that's a nakedly direct assault on the structure and intent of the Constitution itself. There is nothing in the Constitution that requires states to allow their citizens to vote for president, much less award all their electoral votes based upon the vote of their citizens. The presidential election system we have today is not in the Constitution. State-by-state winner-take-all laws to award Electoral College votes, are an example of state laws eventually enacted by states, using their exclusive power to do so, AFTER the Founding Fathers wrote the Constitution, Now our current system can be changed by state laws again. The constitution does not prohibit any of the methods that were debated and rejected. Indeed, a majority of the states appointed their presidential electors using two of the rejected methods in the nation's first presidential election in 1789 (i.e., appointment by the legislature and by the governor and his cabinet). Presidential electors were appointed by state legislatures for almost a century. In 1789, in the nation's first election, the people had no vote for President in most states, only men who owned a substantial amount of property could vote, and only three states used the state-by-state winner-take-all method to award electoral votes. The current 48 state-by-state winner-take-all method (i.e., awarding all of a state's electoral votes to the candidate who receives the most popular votes in a particular state) is not entitled to any special deference based on history or the historical meaning of the words in the U.S. Constitution. It is not mentioned in the U.S. Constitution, the debates of the Constitutional Convention, or the Federalist Papers. The actions taken by the Founding Fathers make it clear that they never gave their imprimatur to the winner-take-all method. The constitutional wording does not encourage, discourage, require, or prohibit the use of any particular method for awarding the state's electoral votes. As a result of changes in state laws enacted since 1789, the people have the right to vote for presidential electors in 100% of the states, there are no property requirements for voting in any state, and the state-by-state winner-take-all method is used by 48 of the 50 states. States can, and frequently have, changed their method of awarding electoral votes over the years. In Gallup polls since 1944, only about 20% of the public has supported the current system of awarding all of a state's electoral votes to the presidential candidate who receives the most votes in each separate state (with about 70% opposed and about 10% undecided). The recent Washington Post, Kaiser Family Foundation, and Harvard University poll shows 72% support for direct nationwide election of the President. Support is strong among Republican voters, Democratic voters, and independent voters, as well as every demographic group surveyed in virtually every state surveyed in recent polls in closely divided battleground states: Colorado-- 68%, Florida – 78%, Iowa --75%, Michigan-- 73%, Missouri-- 70%, New Hampshire-- 69%, Nevada-- 72%, New Mexico-- 76%, North Carolina-- 74%, Ohio-- 70%, Pennsylvania -- 78%, Virginia -- 74%, and Wisconsin -- 71%; in smaller states (3 to 5 electoral votes): Alaska -- 70%, DC -- 76%, Delaware --75%, Idaho – 77%, Maine -- 77%, Montana – 72%, Nebraska -- 74%, New Hampshire --69%, Nevada -- 72%, New Mexico -- 76%, Oklahoma – 81%, Rhode Island -- 74%, South Dakota – 71%, Utah - 70%, Vermont -- 75%, and West Virginia – 81%, and Wyoming – 69%; in Southern and border states: Arkansas --80%, Kentucky -- 80%, Mississippi --77%, Missouri -- 70%, North Carolina -- 74%, Oklahoma – 81%, South Carolina – 71%, Tennessee -- 83%, Virginia -- 74%, and West Virginia – 81%; and in other states polled: California -- 70%, Connecticut -- 74%,, Massachusetts -- 73%, Minnesota -- 75%, New York -- 79%, Oregon – 76%, and Washington -- 77%. Most voters don't care whether their presidential candidate wins or loses in their state . . . they care whether he/she wins the White House. Voters want to know, that even if they were on the losing side, their vote actually was directly and equally counted and mattered to their candidate. Most Americans consider the idea of the candidate with the most popular votes being declared a loser detestable. We don't allow this in any other election in our representative republic. The National Popular Vote bill has passed 31 state legislative chambers, in 21 small, medium-small, medium, and large population states, including one house in Arkansas(6), Connecticut (7), Delaware (3), The District of Columbia, Maine (4), Michigan (16), Nevada (5), New Mexico (5), New York (29), North Carolina (15), and Oregon (7), and both houses in California (55), Colorado (9), Hawaii, Illinois, New Jersey, Maryland, Massachusetts, Rhode Island (4), Vermont, and Washington. The bill has been enacted by the District of Columbia (3), Hawaii (4), Illinois (19), New Jersey (14), Maryland (11), Massachusetts (10), Vermont (3), and Washington (13). These eight jurisdictions have 77 electoral votes -- 29% of the 270 necessary to bring the law into effect. I appreciate your enthusiasm for your cause, but nothing you've said changes my assessment. Plus you are being a bit repetitive here, cutting and pasting some of the exact same text as your first comment. Like I said, I think it is perfectly legitimate for states to make the decision for themselves about how to allocate their electoral votes. I agree with your assessment of the constitutionality. If smaller state legislatures want to disenfranchise their voters by putting their electoral votes in the hands of large urban centers - that is their prerogative. At least until the citizens of that state figure out what has happened, throw the bums out and reverse the law. That is the point. You may get this passed and enacted because it much simpler than a constitutional amendment. But it can be undone just as easily as it is done. It will be undone on a state by state basis as soon as electoral votes are cast by that state in contravention to the wishes of the majority in that state. If this is enacted and enabled, it will be temporary. All your polls may be accurate, but polls change and these poll will certainly not stay this way in the smaller more rural states if and when abolishing Electoral College is ever considered as a constitutional amendment. In that case the consequences will be elevated in public discourse and most states will reject the idea on the rational basis that it is against the interests of their citizens and state. The simple reality is that the systems was designed by founders to limit the dominance of urban over rural interests that would be found in purely democratic institutions. That dynamic is as valid now as it was then. Eliminating the Electoral College means putting the election of the president for all time in the hands of the cities. Not enough people want New York, Chicago, Los Angeles, Miami, Atlanta, New Jersey, Boston, and Dallas to be selecting all of our future Presidents to ever get rid of the Electoral College. Glad to have your comments, but no more filling up my comment thread with cut and paste boiler plate. The population of the top five cities (New York, Los Angeles, Chicago, Houston and Philadelphia) is only 6% of the population of the United States and the population of the top 50 cities (going as far down as Arlington, TX) is only 19% of the population of the United States. A “big city” only campaign would not win. Methinks the Anon doth protest too much. Regarding cities, it's rather disingenuous to compile by cities rather than by metro areas. NYC has about 8M population -- but the NYC MSA is about 19M. The city of Los Angeles has a population of 3.8M, but the metro area is near 13M and the five-county area referred to as "Greater Los Angeles" clocks in at 17.6M. Just two MSA's add up to over 10% of the US population, over 12% if you go with the five-county Greater LA area. The MSA of Chicagoland is around 9.8M, that of Houston and Philly 6M each. Hmm, that adds up to 58+M for the top 5 MSA's, or real close to 20% of the national population. The top 10 MSA's add up to a touch over 80M, or about 27% of the US population. The top 20 add up to over 115M, or over 38% of national population. I'd say a "big city only" campaign would indeed be effective. I'm sure I'm not the only one who finds it rather hypocritical to promote a "popular vote" initiative that is explicitly designed to repudiate the actual popular vote of a state's citizens in order to shift their electoral votes to a cnadidate who LOST in their state. All in the name of "democracy," of course. Under National Popular Vote, every vote, everywhere, would be politically relevant and equal in presidential elections, and included in the national count that determines the candidate with the most popular votes, who then is guaranteed the majority of electoral votes needed to win the presidency. It gives a voice to the minority party voters in each state. Now their votes are counted only for the candidate they did not vote for. Evidence as to how a nationwide presidential campaign would be run can be found by examining the way presidential candidates currently campaign inside battleground states. Inside Ohio or Florida, the big cities do not receive all the attention. And, the cities of Ohio and Florida certainly do not control the outcome in those states. Because every vote is equal inside Ohio or Florida, presidential candidates avidly seek out voters in small, medium, and large towns. The itineraries of presidential candidates in battleground states (and their allocation of other campaign resources in battleground states) reflect the political reality that every gubernatorial or senatorial candidate in Ohio and Florida already knows–namely that when every vote is equal, the campaign must be run in every part of the state. Even in blue states with the biggest cities, urban voters don’t control statewide elections, so they can hardly control a national election. In California state-wide elections, candidates for governor or U.S. Senate don’t campaign just in Los Angeles and San Francisco, and there have recently been Republican governors Reagan, Dukemejian, Wilson, and Schwarzenegger. Just as with a national vote, a vote in rural Alpine county is just an important as a vote in Los Angeles. If the National Popular Vote bill were to become law, it would not change the need for candidates to build a winning coalition across demographics. Candidates would still have to appeal to a broad range of demographics, and perhaps even more so, because the election wouldn’t be capable of coming down to just one demographic, such as voters in Ohio. That would be a prime example of "dodging the issue" with diversionary rhetoric. Multiple counts. I found the concept interesting, signed up, answered the questions, and will monitor their progress. 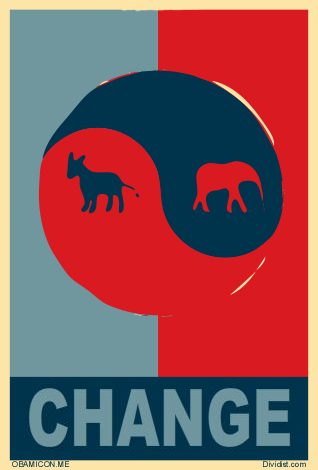 Something needs to be done, as we keep voting in the same two parties and nothing is changing. I'd welcome any reasonable change to the voting process in the United States, which is completely and irreversibly broken. What I'd like to see, more than anything else, is a viable third party. I'm talking about a party that isn't easily taken over by one of the big two.